Are you ready to get cultured? 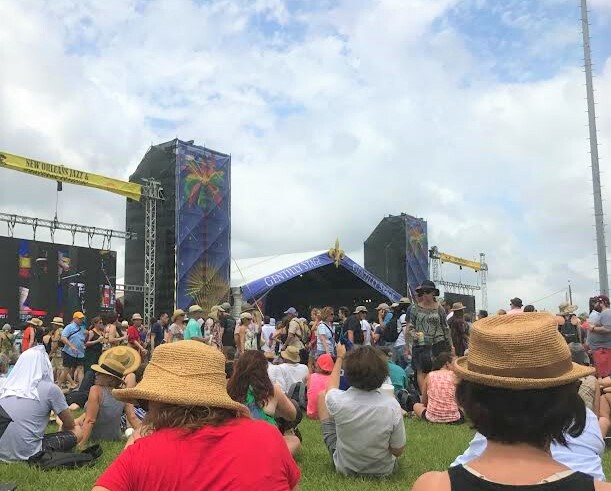 The New Orleans Jazz & Heritage Festival, aka Jazz Fest, is an eight-day cultural extravaganza in which thousands of musicians, cooks, and craftspeople annually welcome over 400,000 people to New Orleans. Held over the course of two weekends (April 25, 26, 27, 28 & May 2, 3, 4 , 5), Jazz Fest features legendary musical acts on multiple stages, incredible Louisiana cuisine in two large food areas, and craft artisans from the region and around the world demonstrating and selling their work. Here’s your local guide to make the most of Jazz Fest this year! Oh, and did we mention? It’s the 50th anniversary! No matter where you’re coming from, it’s simple to get to Jazz Fest (click here for travel packages). The festival is held at the Fair Grounds Race Course near City Park in New Orleans, a residential section of the city where parking in the surrounding neighborhoods is not recommended (unless you like getting towed). Because of this, we recommend hopping on your bike as New Orleans is a fantastic bike-friendly city. Jazz Fest is less than ten miles from downtown and the historic French Quarter and is also accessible by bike from Mid-City or Uptown. If biking isn’t your thing, there are also several other modes of transportation including Uber, Lyft, and Taxis, and Gray Line Tours will operate continuous round-trip transportation fondly named the Jazz Fest Express. These buses will leave from the Sheraton Hotel, the Gray Line Lighthouse at the Steamboat Natchez Dock (Toulouse St. at the River – next to Jax Brewery), and City Park (near intersection of Wisner Blvd & Filmore Blvd. Follow the signs) daily from 10:30 a.m. – 7:30 p.m. For more information, click here or call 504.569.1401 or 1.800.535.7786. Phone charger – just in case! Rain jacket or small poncho (nothing worse than the girl/guy in the front row blocking everyone’s view with his giant umbrella). Totems and flags – a great way to always spot your group! Spread the word: here’s the official list of things you can and CANNOT bring. Drink lots of water. You don’t want to get dehydrated and be that girl/guy passed out on the lawn. Plan out your day – check the lineup to see when your favorite acts play and on which stages. Then, give yourself ample time to get there and get a good spot. Buddy up! It’s inevitable; you’ll get separated from your group at some point. Quick tip: set a “go-to” spot in the crowd where you like to watch shows (e.g., stage left in front of the soundboard). That way, everyone will know where to find each other and rendezvous. Nom nom nom. Jazz Fest is filled with great food from classic Cajun fare to BBQ and sno-balls. You’ll definitely want to carve out some time in your day to enjoy a meal (or 3). Local Tip: Don’t miss the crawfish enchiladas! Check out the fest swag. Be present. Soak in the Jazz Fest experience with friends and family and put away your phone. We know, we know. How can you post a killer video of Leon Bridges without your phone? You’re right, that’s worth documenting. Get the video, then put it away and enjoy yourself! Check out the Cultural Exchange Pavilion celebrating the tricentennial of New Orleans. We barely even scratched the surface of all the goodness that is Jazz Fest. There’s a really cool craft marketplace and a couple of villages where you can learn about Louisiana and Native American culture. Download the Jazz Fest app on your phone or visit their site to learn even more.